Google My Maps is an excellent web tool for creating and customizing maps. Since its integration with Google Drive, users now are able to instantly create, manage and share their maps right from their Drive accounts. My Maps offer a wide variety of interesting features that makes map creation even for beginner users a very easy endeavour. Some of these features include the ability to search for and add places to your map, draw lines and shapes to illustrate geographic locations or give guidance, add colours, markers, icons and labels to your maps, create layers to group various parts of your map many more. As a teacher, you can use My Maps for a variety of educational purposes from giving directions to students and parents for next field trip to organizing virtual trips to world museums and art exhibition. 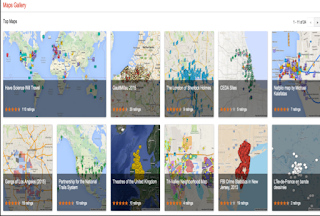 To help you learn more about how to use My Maps, we curated for you these excellent resources from Google My Maps help page. Clicking on any title will take you to the page where you can learn more about it. This guide walks you through the process of creating a new map. It also explains how to find and open an existing map. This one shows you how to add and edit extra information on your map. This shows you how to add your own icons for map placemarks. This shows you how to import different geographical data into your map. This is how to style your map using different colours. This one shows you how to export and download an entire map or just some information on it. This is how to embed your map or a map shared with you on your website or blog using a generated HTML code.